Since opening earlier this year, the popularity of Aron’s Jewish Delicatessen on Chandos Road is such that they’re now ordering between 30-40kg of brisket per week (from their local butcher in St George and Powells of Olveston) in order to meet customer demand for their fantastic salt beef. 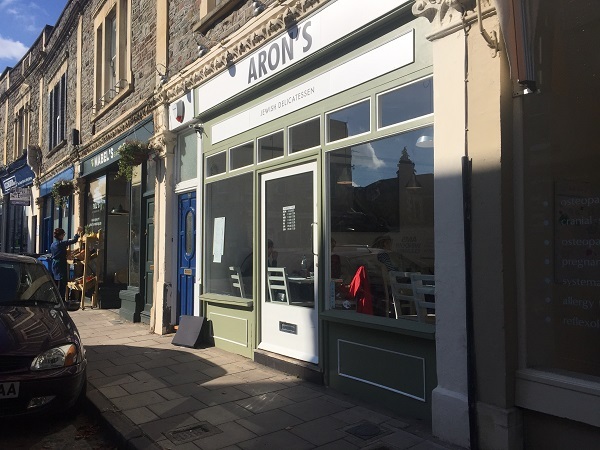 As the only Jewish deli in Bristol, co-founders Marta Aron and Steve Varcoe have already made Aron’s a success, serving traditional Hungarian Jewish comfort food with a South West twist. Their pickled herring and lox are cured in house – along with the aforementioned brisket, which is turned into salt beef. All of the pickles are also made on-site, using Burrow Hill cider vinegar, and the team create a range of cakes that normally use sweet white wine in Hungary, but use sweet cider here instead. Some things need to be truly authentic, though – which is why their bagels are brought in from their favourite bagel shop on London’s Brick Lane. Dishes are listed both on the blackboard above the counter and on printed menus that are brought to the table along with a bottle of tap water. I ordered an additional drink, though: an apple juice and soda (almafröccs) at £2.50 – tasty enough, but I was expecting more fizz. There’s plenty to get excited about on the menu. In addition to their premium deli sandwiches, you’ll find a range of brunch options, including Sólet (stewed tarka beans & pearl barley) with smoked beef short ribs, duck leg, ox tongue and egg; plus latkes, salt beef hash and more. There’s also a range of Hungarian appetisers and extras, along with various sweets such as sour cherry pie and gerbaud (a walnut, apricot and chocolate layer cake) for those after something sweet. Many of the sweets were displayed in a cabinet on the deli’s counter, right beside my table – and while tempting, there was sadly no way I could manage one after my enormous lunch. The decision was a tough one, but I went for a Reuben: at £9.50, it’s probably up there with Bristol’s most expensive sandwiches, but I can confirm that it’s well worth the expense. 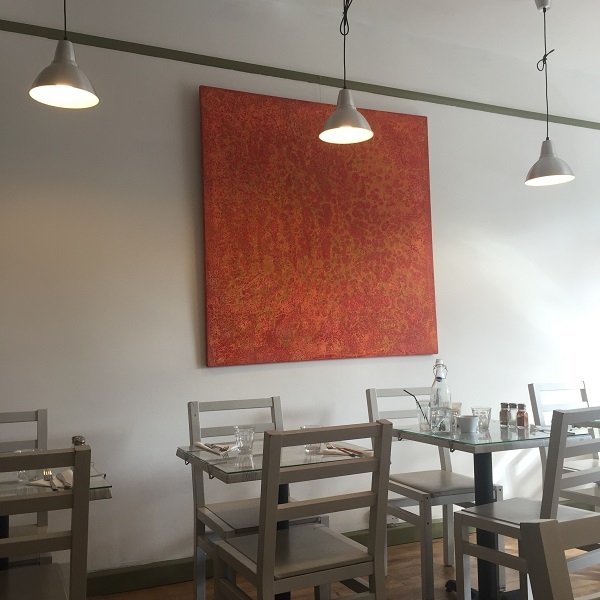 “We don’t do light food”, said co-owner Steve when I visited – “it’s not the Hungarian way”. 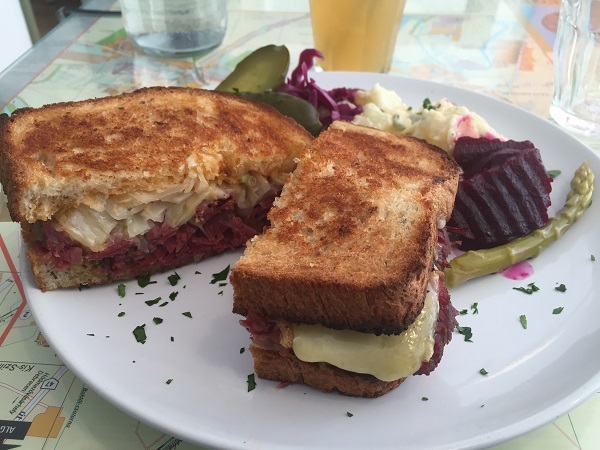 And that’s certainly the case with the Reuben: a rye bread sandwich filled with salt beef (or pastrami – your choice), cheese, Russian dressing and sauerkraut, and served with house slaw, pickles and a potato salad. The pictures below show the small (4oz) option that I ordered – there’s also a 6oz version available for £11.50 for those with a seriously hearty appetite. 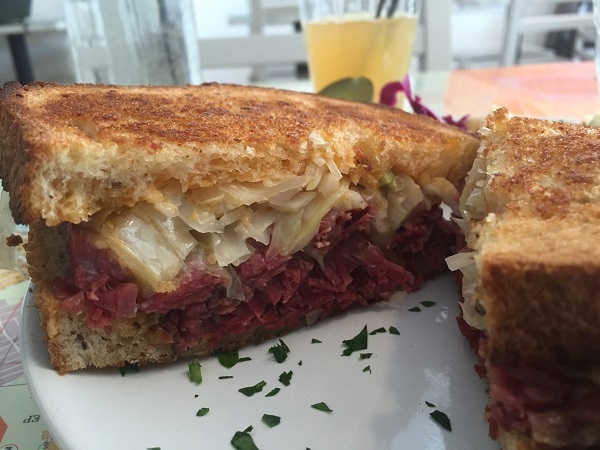 And what a Reuben it was. The bread was beautifully grilled, brushed with chicken fat before cooking to give it a lovely colour and a naughty flavour. The slices of salt beef were thick and rich, not excessively salty and flaking well under the fork. The cheese was mild but a good melter, while the sauerkraut and Russian dressing helped to cut through the richness. The accompanying sides were certainly on the generous side too: a perfectly crunchy asparagus spear, pickled in chilli and lemon; a creamy potato salad with slivers of both red and spring onion; soft, crinkle-cut pickled beetroot, a fantastic purple slaw with a slight aniseed flavour; and a halved pickled gherkin. Delicious.